In my post about Tastykakes I had mentioned that I would write about trans fat. Some might already know exactly what they are, but for those who are still confused, this post is for you. So back to trans fat. 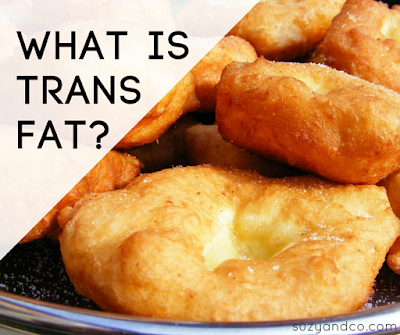 Trans fats get their name from the chemical configuration. There are carbon atoms and hydrogen atoms in a fat molecule and depending on how many there are and how they line up gives them their name. I won't go in to more detail because I do not think most people enjoy nutritional biochemistry as much as I do. Trans fats actually occur in nature, in animal products. They are in extremely tiny amounts though. In manufactured products trans fat come from a process called partially hydrogenated. Basically there are not as many hydrogen atoms and so they will add some hydrogen atoms to the fat. These manufactured trans fat have been found to be not so healthy and it is important to avoid them. Now here comes the fun part, food labels. There are rules on how to label products set forth by the FDA. The FDA creates these rules to supposedly help consumers know what nutrients are in their food so people can make the best choices for themselves. Some rules include that saturated fat must be listed, sodium must be listed, vitamins A & C and the minerals iron and calcium must be listed (no other vitamins and minerals are required). shall be expressed as zero. I want to eat some cookies. One serving of cookies = 2 cookies. One serving of cookies says 0 grams trans fat on the label, but in actuality there is 0.49 grams of trans fat in those 2 cookies. Well of course I am not going to eat just one or two cookies, I am going to polish off six (they were small, I swear). Now according to the label I consumed 0 grams of trans fat, but we know there was some in there and I actually consumed 0.49 X 3 = 1.47 grams. Now 1.47 grams may not seem like a lot, but when we should have zero, it is too much. And you might think 1.47 grams can't really affect someone's healthy negatively, but think about it in these terms: I ate one-thousand four-hundred and seventy milligrams of trans fat, just in the cookies. Who knows what else I ate over the course of a day. So what is the best way to avoid trans fat? Look at the ingredients list. If there is any partially hydrogenated oil listed, then there is added trans fat. Also if it lists hydrogenated and does not specify partially or fully, assume it is partially. If it does list "fully" hydrogenated it will not have trans fat. Hopefully that clears up some of the confusion. Another reason to eat real food!